So, you’ve decided to take that final step and get braces to achieve the smile you want, but you don’t know exactly what to expect. Or perhaps you’ve just had your braces put on and you’re wondering if your experience is normal. Either way, our expert for pediatric dentistry in Belton, MO, wants to provide some information on what to expect with new braces! When your braces are first put on, the adhesive for the brackets will need about 24 hours to set. Try to stick with soft foods at first and keep an eye out to check that the brackets set properly. Make sure that you have all the tools you need, such as a water pick, floss, dental wax or elastics, and schedule a follow-up appointment with our orthodontist. Since braces are putting new pressure on your teeth to perfect your smile, it is normal to feel some discomfort for the first few days. 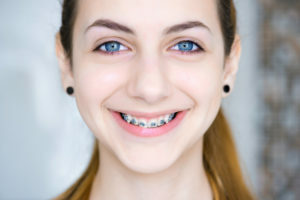 However, it should be temporary and resolve within five to seven days as you adjust to your braces. You may use pain medication, like Tylenol, to help with the discomfort. If you’re experiencing extreme pain, the pain persists for longer than a week, or you have wires poking you, contact our orthodontist to schedule an appointment. What Changes Should I Make? The most important changes you should make in your daily habits are frequent brushing and flossing. Ensuring that all food is removed from your braces will help you avoid decay and staining around the brackets. Additionally, avoiding crunchy, sticky, or otherwise hard foods is incredibly important to preserve your braces and avoid cracking your brackets. If there is damage done, it may lengthen your treatment time! Contact Our Expert for Pediatric Dentistry in Belton, MO, For More Information! The information provided in this article is not meant to be medical advice and is for educational purposes only. If you would like to learn more about braces, Invisalign, or other orthodontia-related topics from our orthodontist in Belton, MO, feel free to contact Burleson Orthodontics by calling 816.759.0123.